As an invited guest, Dr. HuiMing Bao, professor of Department of Geology and Geophysics of Louisiana State University, visited the <?xml:namespace prefix = st1 />Institute of Geochemistry, Chinese Academy of Sciences (IGCAS) last week. 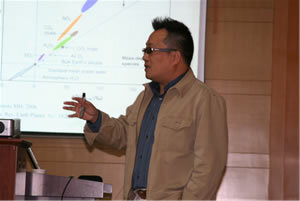 Prof. Bao is a famous scientist in stable isotope geochemistry. He gave two speeches during his stay in IGCAS about 17O anomaly and its application in geosciences on 24th Feb. and 27th Feb. respectively. 17O anomaly is considered as a new tracer for many important geologic events. Prof. Bao studied the 17O anomaly in sulfates buried in some special sedimentary rocks and found many important evidences to support the key hypotheses in earth history research. His results have been published on Nature and Science in recent years (four of them as the first author, and one as the second author). These novel contributions made him one of the distinguished researchers in the field of stable isotope geochemistry. During his visit, Prof. Bao spent several days to discuss with host Prof. Yun Liu’s theoretical and computational geochemistry group in IGCAS about many frontier problems of stable isotope geochemistry. He gave many insightful suggestions to the research work of Prof. Yun Liu’s group. Prof. Yun Liu’s group are also conducting calculations and theoretical study of isotope systems that Prof. Bao is interested in. Both sides felt interchange very fruitful and would like to continue the collaboration. Prof. Bao promised another visit to IGCAS in near future.